I've been watching "NYPD Blue" systematically from Season 1 - I'm up to Season 9 right now. (My wife calls cop shows "soap operas for guys.") Part of what I love about the show is the character development, and the fact that all the protagonists are complex and deeply flawed. None more so than Detective Andy Sipowicz, whose struggles with alcoholism, intimacy, fatherhood, and loss make him a compelling and sympathetic anti-hero. The show constantly raises questions of forgiveness and accountability for the ways people hurt each other. 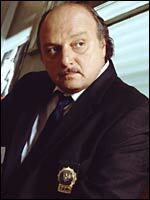 Sipowicz isn't a very nice man, but he's a good man who sometimes does bad things. We forgive him his shortcomings, in part because we understand his suffering - it's the same as ours. Compassion through identification with others is the basis for our forgiveness. The sanskrit phrase that Schopenhauer loved so much was "Tat Tvam Asi" - literally "Thou art That." John Lennon may have translated it best: "I am he as you are he as you are me and we are all together." Not just because everything we do affects one another, but because we are ALL made of the same flawed, unstable, perishable material. I try to keep this in mind, in life and in my music. I want to invite you to incorporate Schopenhauer and Lennon's idea as best you can: to try to understand others' fears, worries, shortcomings, insecurities - all that makes them do things that need forgiveness. That's not to give others a free pass, but so that we don't approach tough situations with anger and resentment guiding us. Try it with your closest friends and family, and then extend it to others. As the comic strip character Pogo once said, "We have met the enemy, and he is us." If we are humble about our own shortcomings - our capacity to do harm to others - we might find a way to do what must be done, including handling life's disappointments and hurts, with forgiveness and not anger leading us.